Tire Ink is the easy way to give your vehicle that Racecar/Motorsports look. 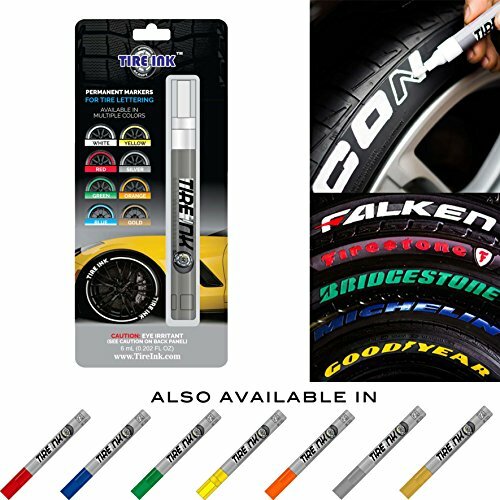 Inspired by our love of high-performance racing, we have developed Tire Ink to be a long lasting solution to give your tires a colorful accent for as long as you want. Step 1: Wash wheels and tires with soap. Step 2. Prep the area you want to paint with Acetone or a Degreaser until no more Black dirt/oil comes off onto your rag. Step 3: Choose which side of the reversible tip you want to use. Thick side for raised letters, or thin side for recessed letters. Step 4: Prime the pen by pressing it down on a clean flat surface until the paint starts to flow. Step 5: Start writing on the tire by outlining the letters and then filling in the inside. We recommend 2-3 coats. If you have any questions about this product by Tire Ink, contact us by completing and submitting the form below. If you are looking for a specif part number, please include it with your message.